Q1 is over and it’s time to do a business cleanup – it’s kinda like spring cleaning your house, but more fun and leading to more money in your wallet (not just less junk in your garage). 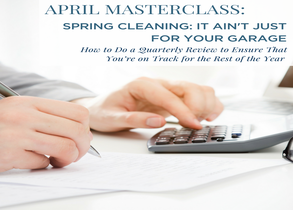 Doing a spring cleaning of your business can lead to a higher profit margin and lower overhead. We’ll show you how to do a quarterly check on your business and your finances. Not only is it easier to do this on a quarterly basis than once or twice a year, it helps you adjust your spending and make sure that you’re on track for your annual budget.At this master class, you’ll learn how to check your finances for overspending, make sure that you’re on track with your 2018 budget plan, make adjustments where needed, and track your expenses to have a better grip on where your hard-earned money is going. For example, did your car insurance company jack up the prices 7% this year? We’ll also show you how to scrutinize your finances for those “creepers,” helping you potentially save thousands each year. You’ll walk away ready to rock Q2!